Hardcover books selling Hollywood style are notorious for ending up in the bargain section of Barnes and Noble following a brief reign as pricy eye candy for end caps, but far too often they’re simply regurgitated imagery and content packaged in new, enticing ways. In the case of Classic Hollywood Style (Francis Lincoln Limited Publishers) Edinburgh-based writer and journalist Caroline Young saves the film and fashion aficionados who will likely gravitate toward her book from such disappointment by not merely detailing the iconic looks donned by film stars of the 1920s through the 1960s but contextualizing them within film and fashion history in a way that gives a surface-oriented subject depth and meaning. Fusing scholarly research with journalistic presentation is a method Young uses, no doubt, to marry her academic and career achievements, but it also benefits readers who can trust that they’re getting an accurate account without being burdened by the theoretical angles found in a similar book published by an academic press. It’s very common not to footnote in a book where the photos take center stage, but quite admirably Young took the time to do so. The 211 pages covering costume designs from 34 films, including Morocco (1930), Gilda (1946), A Place in the Sun (1951), and The Thomas Crown Affair (1968), are dotted with references and followed by several pages of endnotes revealing Young’s wealth of source material, which consists of period news pieces, industry memos, and production files, among many other interesting tidbits. It’s also necessary to compliment Maria Charalambous for designing the book’s clean, stylish layout. Her thoughtfully selected fonts and minimalist approach left plenty of room for Young to add even more elements to each film’s unique history. In addition to describing the film’s wardrobe highlights in photo captions, Young utilized what would have been empty white space to add fascinating, often amusing anecdotes in quasi-footnote form. 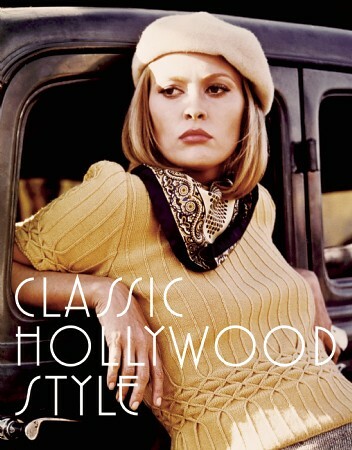 And to appeal to readers who buy similar books in effort to transform past fashions into modern looks, she worked in sidebars throughout that summarize how to achieve such styles as Greta Garbo’s “chic androgynous look” in A Woman of Affairs (1928) or Faye Dunaway’s irresistible Bonnie look in Bonnie and Clyde (1967). Young has succeeded at producing the whole package, as it were. In this truly engaging read, you get biography, film history, sartorial history, style advice, and a little bit of gossip in nearly three dozen individual accounts that demonstrate how, in old Hollywood, all of these things intersect in the best possible way. It’s unlikely Classic Hollywood Style will be purchased purely for the photos, but because it’s filled with costume design sketches, film stills, and candid photos with impressive reproduction quality, it certainly would make a great reference book for nights out on the town post-read.